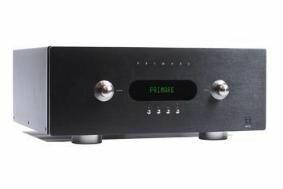 Primare unveils new multichannel amp and processor | What Hi-Fi? The Primare SPA22 is a 5x120 watt integrated amplifier. This replaces the much-liked SPA 21, and shares the same minimalist exterior design. However, internally it's all change. The power supply is now a switch mode design, and the power amplification makes use of the company's newly developed Class D circuitry. The SPA 22 will be available in two guises. As standard it won't decode Blu-ray high-definition soundtracks, relying on the partnering Blu-ray player to do the work. The higher spec version of the SPA22 (to be released once the new boards are ready) will have upgraded video boards and be able to decode all current HD surround sound formats. This version will also upscale to 1080P and upconvert analogue video to HDMI. Expect the standard SPA22 to cost around £2750. Price for the higher spec version hasn't been announced as yet. Primare's other new product is the SP32, a multichannel processor. Like the integrated model, this will only handle PCM through HDMI, though once the higher-spec video board is ready you'll be able to buy a version that decodes all current movie sound formats. Price for the standard processor is expected to be around £2750.